Bird atlases have been conducted worldwide with the aim at mapping the distribution, and often abundance, of species over a large geographic area and for a fixed amount of time. They follow a standardized methodology and are intended to be repeated at 20-year intervals. In North America, several states and provinces conducted "first generation" breeding bird atlases that collected comprehensive distribution information on breeding birds in their defined region. These atlases now serve as a baseline by which present atlases can be compared. Why the Focus on Birds? Birds are excellent indicators of environmental health. They are conspicuous and occur in all ecoregions and habitats. As such, bird conservation is of paramount importance. Birds enrich our lives, and people value them and the ecological benefits they provide, such as in pollination and pest control services. 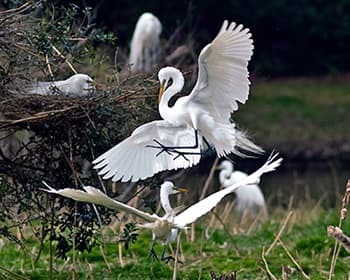 Further, many people can find, identify, and enjoy observing birds, as is evidenced by the multi-billion dollar annual economic contribution from birding and bird related activities in the country. Why a Maine Bird Atlas? Maine conducted its first breeding bird atlas between 1978 and 1983 (PDF). With the conclusion of the first atlas 33 years ago and the lack of any state-wide assessment of wintering birds, our comprehensive understanding of bird diversity and distribution in the state is now dated. To address the mission of the Maine Department of Inland Fisheries and Wildlife to preserve protect and enhance wildlife populations for use and enjoyment by current and future generations, the need exists to improve our understanding of the abundance and distribution of Maine's birds. Data collected as part of this project will provide a comprehensive understanding of the distribution and use of resources by Maine's birds and will be invaluable in guiding future species status assessments, priority species' needs, and identifying and conserving high value wildlife habitats. The Maine Bird Atlas is a citizen science project, which means it's dependent on volunteers to conduct most of the data collection. Maine has a strong birding community of both residents and visitors to the state that we hope will contribute to the largest bird monitoring effort to ever occur in the state. Not an expert birder? Not a problem! Every sighting counts!! Honestly! Anyone with an interest in birds, nature, or outdoor recreation can use this as an opportunity to learn about birds and be involved in a critically important conservation project. Sign up to observe birds near your home, at camp, or adopt a whole block. And, spread the word - We need your help! Thank you for your interest in this important project! Upon completion of the project, all data will be analyzed and summarized in a comprehensive volume and available to everyone both online and in book form. Amateur birders and professionals alike will find value in this atlas information. 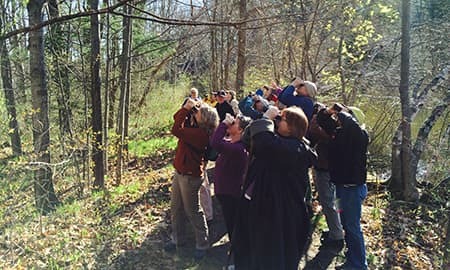 In addition to serving as a simple guide to birders for finding species of interest in the state, this information will be utilized by biologists at the local, state, regional, national, and, perhaps even international level. First and foremost, the data collected as part of this project will be used by state biologists to inform future State Wildlife Action Plans. Action plans provide the foundation for wildlife conservation in states. They identify species and habitats of special concern and identify conservation and research priorities for the future. In fact, Maine’s 2015 Action Plan identified a contemporary bird atlas as a priority conservation action! In addition, other state and federal biologists, especially those within the U.S. Fish and Wildlife Service, will use atlas results to help inform individual species’ status assessments and subsequently the allocation of funding, conservation of high value wildlife habitats, and direction of disturbance activities away from such areas. The wealth of information produced from other state atlases have also supported multiple graduate research projects, and we anticipate the Maine Bird Atlas will be no different. There are many more research questions to be answered than our initial analyses will address.